Oregon Trail Live, the real-world competition based on the Oregon Trail PC game, kicked off with the startling crack of a bullwhip in Salem, Oregon this past Saturday, sending "wagon trains" "westward" from "Independence, Mo." (a.k.a. the check-in area) to complete ten OT-derived challenges en route to Oregon's Willamette Valley (a.k.a. where we were all actually playing). Trailblazers—those of us playing the game—had been encouraged to make up backstories for their emigrant personas. On the drive from Portland my team decided to embody a colorful crew of outsiders. There's "Rippin'" Rachel, a prostitute headed west for the lower-competition lonely-frontiersman market; "Rootin' Tootin'" Rebecca, a jilted wife seeking revenge on her runaway husband; and yours truly, Johnny "Cyanide" Appleseed, a drifter with a shady past. Together, we're Team on the Run—motto: "Oregon or Busted." Once we've constructed our symbolic miniature wagon, we hit the trail. 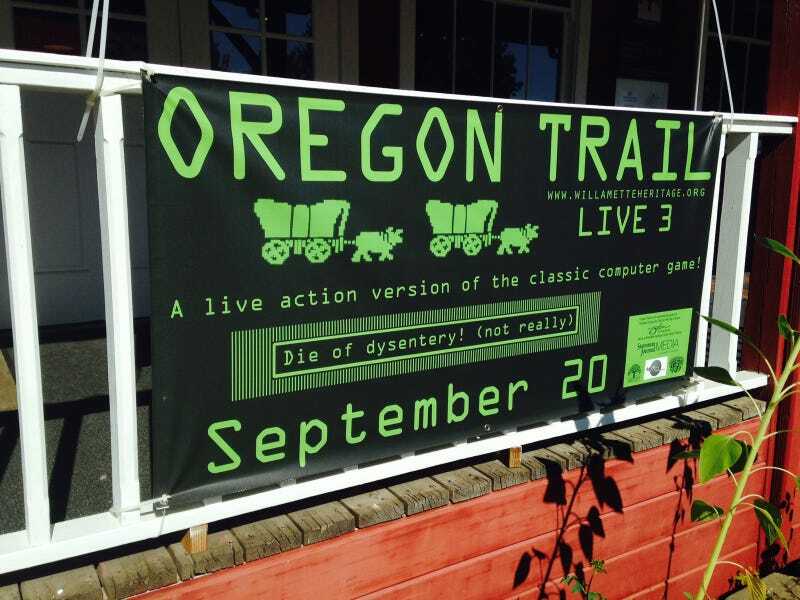 Our first challenge has to do with the scourge of The Oregon Trail: it's the three-legged dysentery race, an out-and-back sprint to the outhouse. A lady pioneer hikes up her skirt to prevent tripping and asks the judge if she'll allow it. She will: "When you've got dysentery, anything goes." Team on the Run loses badly, but a bribe of seasonal produce gets us a gold star anyway. Bribery—not part of the computer game, true, but maybe it should be? Cc: MECC—is condoned and then some by the event organizers, and turns out to be pretty much the name of the game. While caulking (Saran-wrapping) our wagon at the Platte River crossing (a gauntlet of kiddie pools), we run into competition creator Kelly Williams Brown. It's hot, and the redhead is reddening even under her broad hat. The real Oregon Trail sounds like too much work, she tells me. "I hate walking for more than, like, a block-and-a-half. I would have just stayed an Irish peasant forever." Down the trail, we have to bury our "ill-fated team member," a paper doll we called Billy. (Cause of death: knowing too much about my character's shady past.) Growing up, maybe my favorite part of The Oregon Trail was naming my characters after my brothers and laughing my head off when they died of a snakebite or what-have-you. Looking around the grounds of the Willamette Heritage Center, where the event's being held, I see surprisingly few nostalgic twentysomethings and surprisingly many families with kids. Nice to know the game's become multigenerational, I suppose, but I shudder to think what newfangled, over-complicated version of OT they must be familiar with. Awards are presented in Miss Milly's Saloon, Gambling Parlor, Dance Hall and Arm Wrestling Emporium, where the sarsaparilla flows as freely as the Willamette. Prizes in the form of decorated cowbells go to the team with the best original dirge for their ill-fated team member, the team with the most attractive homestead, and the team that faced the most hardship (read: lost). Thanks to several "gifts" to judges, Team on the Run ties with another group for top honors, but ultimately loses the coveted Golden Cowbell in a one-sided arm-wrestling match. That's OK: headed home across the totally migration-worthy Willamette Valley, having spent the day paying tribute to this iconic, enduring game, it hardly feels like a loss. Jonathan Frochtzwajg is a freelance journalist who has reached the Willamette Valley. It's rainy here. jfrochtzwajg.com // @jfrochtzwajg.